Over the years the village's old fishermen's cabins have been slowly transformed into bars, restaurants and shops. According to the Population and Housing Census 2002, the town has a total population of 13,869, of whom 6,985 were men and 6,884 women. The main economic activities of the town are tourism, commerce and fishing. In 1977 Adelphia Dane Bowen, Jr. of Texas became the first foreigner to build a private home in Las Terrenas. He was Economic Officer at the U.S. Embassy in Santo Domingo, Dominican Republic at the time. Las Terrenas is popular with foreigners and people from the capital, Santo Domingo. The completion of a new highway in 2012 between Santo Domingo and Santa Bárbara de Samaná has enabled easier access, and the drive takes two hours. The new Samaná El Catey International Airport is open for international flights, mainly from Europe and Canada. Las Terrenas developed a new aqueduct in 2013. In March 2012 the town installed a new fiber optic Internet/TV/telephone system. ^ "Las Terrenas - DavisHunter.com". www.davishunter.com. Retrieved 2016-08-21. 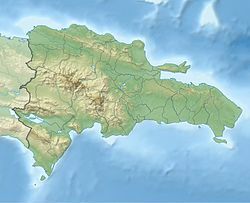 ^ "Las Terrenas History". www.lasterrenasgo.com. Retrieved 2016-08-21. ^ "Real Estate in the Realities and Lifestyles Community in Las Terrenas". PlayaMax Real Estate. Retrieved 2016-08-21. This page was last edited on 23 February 2019, at 02:29 (UTC).